Welcome to my Christmas kitchen! My kitchen reveal has been long overdue! As a #LowesCreator blogger, I was given a Lowes gift card back in August to help me spruce up my kitchen. I used the gift card as incentive to finally paint my kitchen cabinets white, replace the light fixtures, and update the faucet. I actually had a pretty gooseneck faucet in oil-rubbed bronze but it wasn’t a high quality fixture and the finish was peeling. So today I am going to show you my Christmas kitchen! To show you just how far this room has come take a look at the very original before and after. Yowza that red was bright! Aaaaaahhhh. The after is so much more peaceful! My granite is black uba tuba but with the red walls it looked green. I can’t blame a previous owner for the “before”—that was all me. I designed our kitchen both times around and chose every single detail down to the knobs. It’s fun to see how much my taste has changed in five years! I hired Alterwood Fine Furnishings to paint my cabinets. It still took a month for them to complete the job, but I am thrilled with the finish on the cabinets. They are factory-quality smooth and honestly way better than I could have accomplished on my own. The cabinets were primed with two coats of Zinnser Bin Primer and topped with a coat of Benjamin Moore Impervo in White Dove. I left a few cabinet doors off to give the kitchen a more cottage feel. Here is a picture of the opposite side of the kitchen. I couldn’t resist decorating my refrigerator for Christmas :). My globe Allen & Roth light fixtures from Lowes are so fun and add charm. I would have loved to add a farmhouse sink, but my new faucet is almost making up for not being able to afford it! Some of you might remember the wood stools painted white that used to be in my kitchen. I loved my stools but they were just too bulky for our space. As you can see, our kitchen table butts right up to the bar. The new stools allow all four of us to sit and can be stacked and stored when entertaining. I also love the modern touch they add to my traditional home! Here is another shot of my lighting. 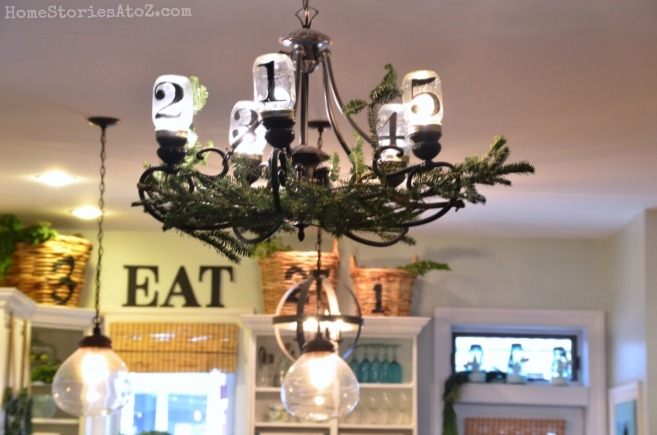 The mason jar chandelier is just a previous light fixture that I DIY’ed with mason jars. You can read about it in the link above. The Allen & Roth cage pendant light in the background is also a Lowes purchase. Isn’t it fun? Here is one last shot of the entire kitchen! I love it! And for your convenience, here is a source list for you :). Thanks for being so patient for the reveal! I actually have one more thing to add in here and will be showing you that update soon!! Hello! I have been pricing out having a professional paint my kitchen cabinets. Do u mind me asking how much ur professional painter charged u? Not at all. Prices vary GREATLY depending on your location, size of kitchen, and paint you & your painter decide to use. I have over 40 door/drawer fronts in my kitchen and wanted Benjamin Moore paint to be used. My cabinets cost $2000 to have professionally sprayed. I have another blogger friend who lives in Utah and only paid $1200 to have hers sprayed. Beautiful! I love it all 🙂 what is the color of your counters? The ones with cornwall england stamped on them… Thanks! Hi Tanya, I bought them at Target. They were part of the Privet House collection. I love your kitchen Beth! So pretty! Hi Beth, I’m a new follower and have just looked through many posts and tutorials of yours…love your beautiful site! We just purchased a 44 year old house and it hasn’t been decorated in…44 years! The kitchen floor was orange, green and yellow vinyl stones about 3 feet each…not a pretty sight. So I have been painting and I covered that hideous floor (vinyl tiles for now), etc. Not much decor has gone up needless to say and then Christmas came, so down it all went! Anyway, thanks for the inspiration, your home is BEAUTIFUL and it gives me hope!! Hey, girl! As usual, I’m behind on checking out great reveals. Love, love your new kitchen, it looks SO much brighter and airier and I know you love it too. Gorgeous touches, the new lights, painted cabinets, all of it is spot on. I know you are thrilled!! Merry Christmas, my friend! What an amazing before and after! I love the open shelving. Thanks Jenny! I found those bowls on clearance at Marshalls or TJ Max several months ago. Dropped my jaw when I saw the difference! It is beautiful! A friend pinned your makeover on Pinterest – it’s beautiful. I’m sure it was worth the wait! I love your backsplash. It looks like rocks. Where did you find them? Love this Beth! Love how you tied the bow on your fridge – love that ribbon – I don’t think our store has that. Beth, It looks great. 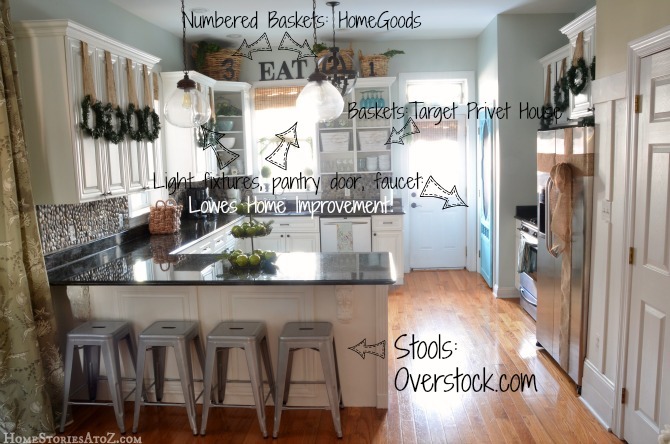 I’ve been eyeing those stools on overstock.com for a while! Oh my goodness! Your kitchen is absolutely breathtakingly gorgeous! I absolutely LOVE it! 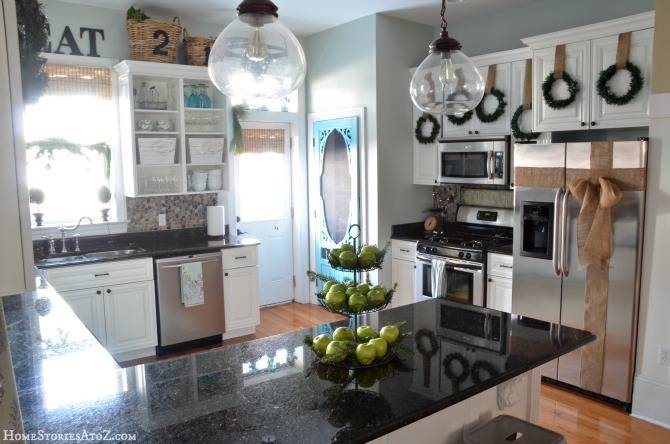 Beth, love your kitchen especially that BOW wrapped fridge…it looks fantastic in burlap! I’m exactly where you are – similar everything in my kitchen (dark cabinets, uba tuba granite…) and am slowly taking the industrial cottage path. I love everything you did – thanks for the inspiration! I like the “new” kitchen so much better! I just love my white cupboards and was so lucky to fall in love with a home with them already here. I know you’ll love your kitchen for years to come…such a classic look. Wow. What a transformation. Looks like a completely different space. Love the new lighting and the open cabinets. Perfect touch. Like how you moved the EAT sign, what a perfect HOME for it! Nope you didn’t miss it. I forgot to share it. It’s Sea Salt by Sherwin Williams. I have it in my dining room as well and love it. It’s a very soft gray/blue. WOW this is amazing! I think kitchens are one of my favorite things to see painted, doesn’t even look like the same space, stunning and fabulous! Wow! It turned out completely gorgeous!!! You’ll love the paint. We used that at the last house and it wears really, really well. We did Jade Mist. It was so pretty. It wipes down really well. 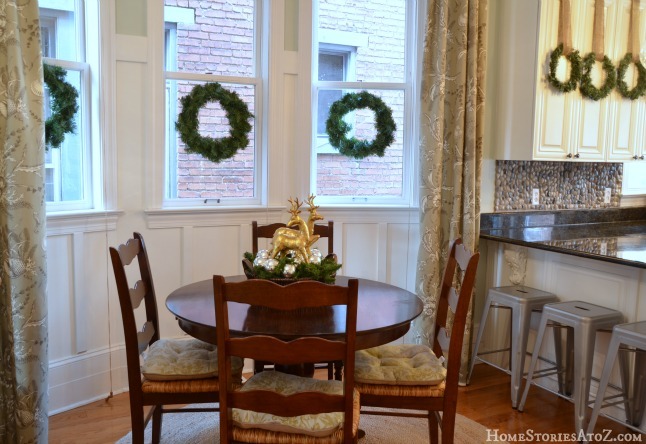 Enjoy you fabulous new kitchen for the holidays! Wow…great transformation. I love so many things but your mixture of light fixture caught my eye, we recently remodeled our kitchen and used the Allen & Roth bronze pendants from Lowe’s that look like mason jars but can’t find a good pendant light for over the sink. Dear Beth, I love your style. How did you do your great backsplash? Oh, I just love it! I am getting ready to paint my white kitchen cabinets and red wall kitchen into something more like yours with gray walls. I am tiling my backspash with white subway tiles, but I am taking off that black part of the backspash that you left on so it makes the backsplash look longer and doesn’t visually cut the look. You have given me great inspiration. Beautiful! Great idea Terry! Before we put up our stone backsplash I had wanted to do the same thing but good golly they cemented that baby to the wall! I got off one piece and my wall was in shreds so needless to say it stayed :). I adore white subway tiles so no doubt your kitchen will look amazing!! Wow! I love your kitchen, it looks so pretty!! I especially like the lights from Lowes above the counter. We recently remodeled our kitchen and put up ugly lighting, knowing we were going to change them when we found something we liked. I saw yours at Lowes and wasn’t sure how they would look. They look fantastic! I think I will change them now!! Darlene it is gorgeous! And yes, I think those lights will look perfect in your kitchen. 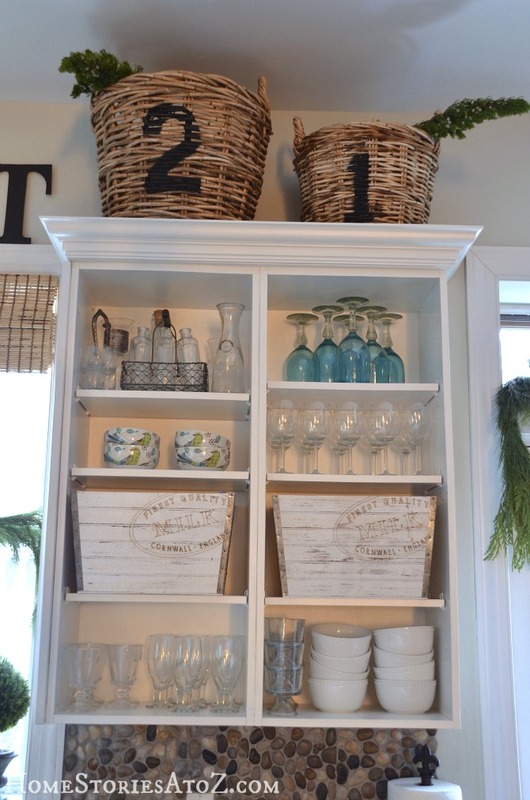 I especially love the beadboard on sides of all your cabinets. I might need to add that to mine :). Also, you have the same stools that were previously in my kitchen. I kind of miss them. I LOVE what you did. It is exactly what I want to do. Thank you so much for instructions on what you did and where you went, that will be so helpful. Your new kitchen is absolutely BEAUTIFUL!! Only 1 question: Why are things numbered? LOL! I have no idea! I numbered my stairs. I have pillows with numbers. I just like how they look :). Great job! I love ALL your “stuff”! I have the canisters that go with your sugar and creamer! I saw those adorable canisters and almost snatched them up! Wonderful job Beth! Everything looks lovely! Absolutely gorgeous Beth!! Love all the lighting. Simply stunning!! I just got the same barstools as an early Christmas present from my husband. I love them so much. They are a huge space saver for us. Your kitchen is beautiful!! Aren’t they affordable too? I thought they’d be pricier so was relieved to see the pricetag. Good early Christmas present! Enjoy and thanks for visiting Jessica :). I love it! 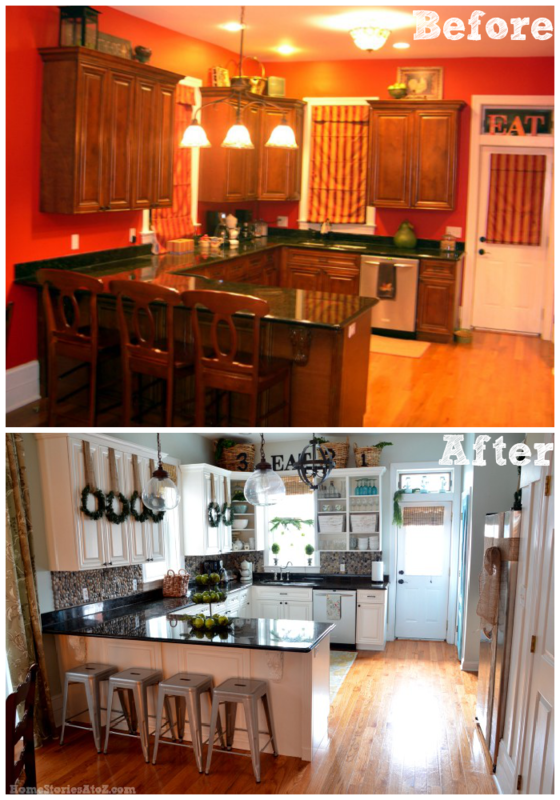 You’ve given me some great ideas about how I can update my kitchen without getting rid of my black granite countertops. Thank you! Oh good! Yes, keep the black granite. It’s expensive stuff. What a transformation! I know what you mean loving reds and warm colors about 5 years ago b/c I was the same way! I love the cabinets white and the lighting decor you picked is perfect. I think your black countertops, white cabinets and open shelving are beautiful together. I’m sure you love coming into your kitchen now for that morning cup of coffee 🙂 Oh, and I almost bought similar stools on overstock. Love the industrial touch they add. I’ll pin later tonight. I was early on the red & gold bandwagon. I started in about 1999 when I was married and didn’t drop it when we moved here 5 yrs ago even though I was totally over it. I was trying to save money. Ha! Biggest mistake I made was trying to make everything we had work in this new home. But it certainly makes for a better before picture :)! 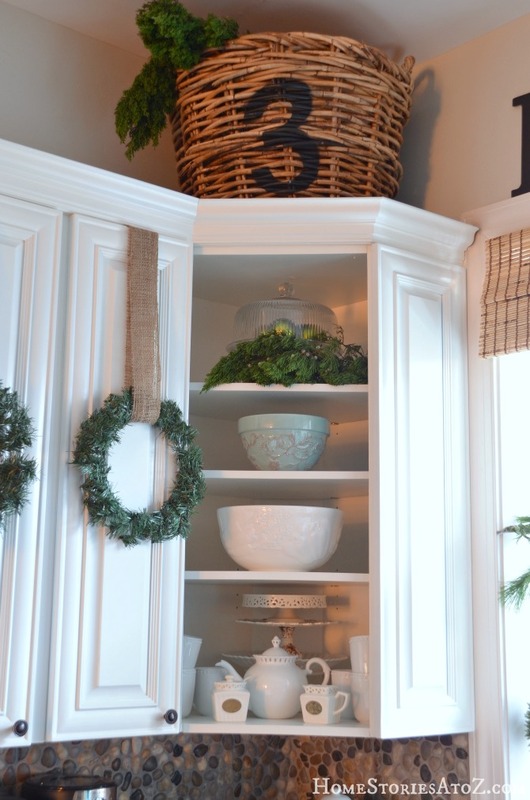 Love love love the wreaths on the cupboard doors! I’m so glad you hopped on over Michele! Thanks so much :). It looks so much more fresh now, you ‘ve done a great job! What impressed me is how the color of an object can change depending on what is next to it. As far as it concerns tastes, when I look 20 years back I see that I was much more conservative then than now in my 40s. Thanks Tina! It’s always fun to see how our decorating taste reflects who we were at the time. Picture my jaw dropping! That is a fantabulous reno, it’s just picture perfect! Wow…It is gorgeous white! It is amazing how bright it makes it feel! I can’t wait to change my kitchen, painting the cabinets had been on my list for years! The problem is once I start the painting, I know I’ll need to change the counter tops, appliances & more! 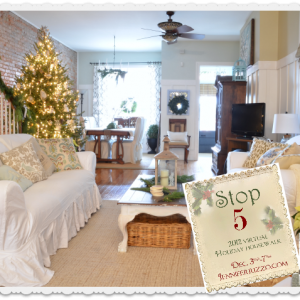 I just LOVE your decorating style, your whole house looks beautiful!! 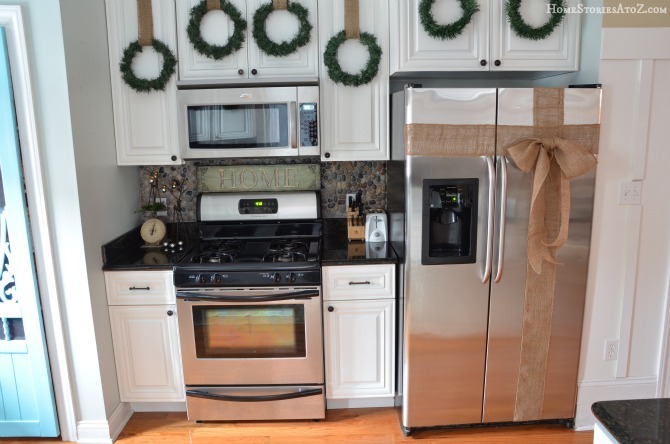 Love the ribbon and bow on the frig. Isn’t that fun? I love it too. Thanks for stopping by Traci! I’m so glad because it’s been a ridiculously long wait! Thanks Kerri :). Wow! What a difference! Your kitchen looks so spacious and bright! Love every detail including the pantry door! 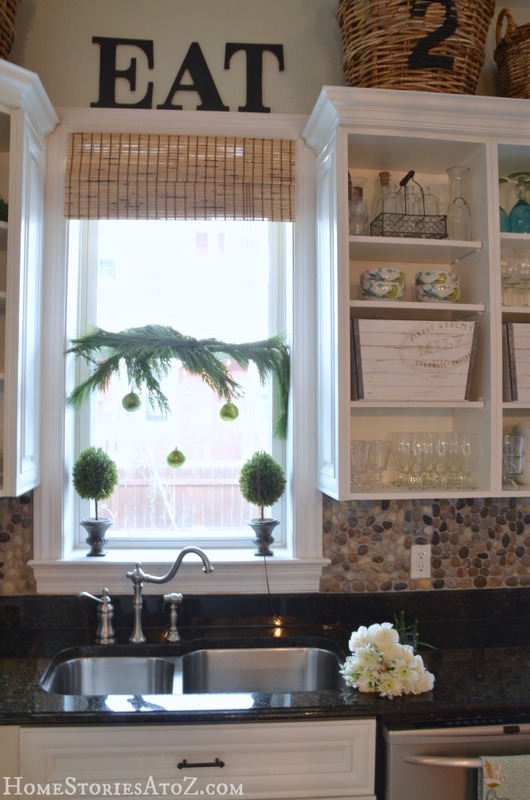 And that pebbled backsplash is fabulous. I could go on and on…. Thank you Jane! I’m loving how much brighter it makes our entire level. Beth; Your makeover is spectacular!!! 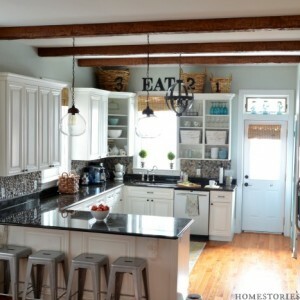 I especially love the added burlap bow on the refrigerator. The Allen & Roth fixtures and faucet are perfect. 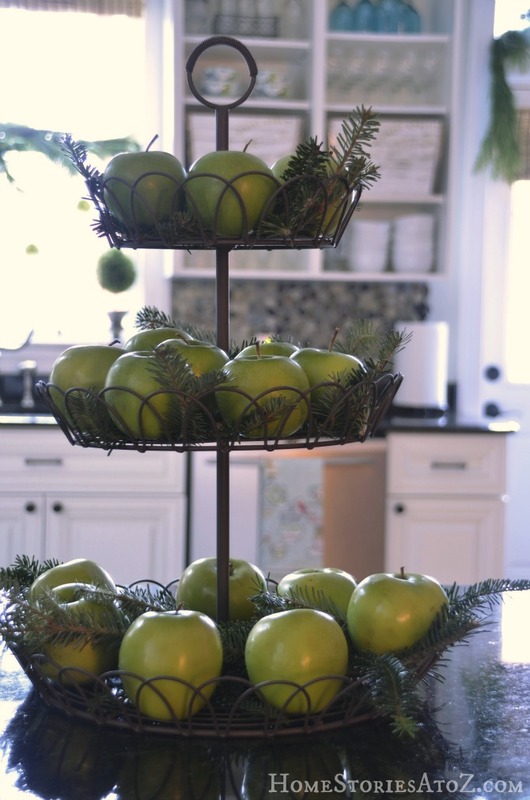 I also adore your wreaths and accents of burlap against the fresh white finishes. Thanks for hopping over here Heather and taking the time to leave me a sweet comment! I appreciate it :). it’s gorgeous! You never disappoint. it really is amazing to see what we liked 5 years ago! my tastes now are so different, and heck 5 years isn’t that long to be such an extreme opposite in the way i am now on some of my tastes! your kitchen is so fresh & crisp with the white. just beautiful! Thanks sweet girl! It will be interesting to see what another 5 years brings, eh? Beautiful Beth! Great job on all the details! Beautiful! Want to come redo mine?! Ha! No :). But thank you! It’s beautiful Beth! I love it. It’s such a change! I painted our kitchen terracotta orange when we first moved in.. Whoa, how things have changed since then. 🙂 I love watching bloggers styles change and evolve. Anyway, it’s Gorg! And the Christmas touches are perfect. It’s so fun to watch us all evolve! Thanks girl for the compliments :).